The Shrewbot, which is the latest in a series of robots to use ‘active touch’ rather than vision to navigate their environment. (PhysOrg.com) -- The Etruscan shrew, one of the worlds tiniest mammals, measuring around 4 centimetres long, is the inspiration for a ground-breaking new robot developed to use sophisticated whiskers to find its way around. The Shrewbot is the latest in a series of robots which use active touch rather than vision to navigate their environment. The Shrewbot has been developed at Bristol Robotics Laboratory (BRL) in collaboration with the University of Sheffield Active Touch Laboratory as part of the BIOTACT project, Professor Tony Pipe (UWE Bristol) and Professor Tony Prescott (University of Sheffield) are working on the Shrewbot project with a number of partners. BRL is a collaboration between UWE Bristol and the University of Bristol. The Etruscan shrew is nocturnal, relying on its whiskers to find, track and capture its prey  often the same size as itself. The efficiency of this tiny creature has inspired scientists to look at ways of replicating the shrews whiskers to enable robots to find their way around without the use of vision. Vision is the sense that has so far been most extensively studied and understood in terms of how it could be used for autonomous robots. However there are numerous examples in nature, particularly in nocturnal creatures, where active touch plays a primary role in how the animal finds its way around and how it behaves. The research has developed man-made whiskers that can move separately and are mounted on a mobile robot. 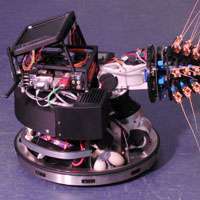 They mimic the capability of the shrew by capturing information in the robots environment and allow it to make decisions about how to move in a particular environment. How is this much different from their previous bot from 2009? Such amnesia is an example of journalistic plagiarism. It should be handled in the same way, like this scientific one. It's not plagiarism - sincde all these bots are made by the same people (Bristol Robotics Laboratory). Just HOW did the Shrew manage to survive before the evolution of the whiskers? Just like any other animal without whiskers. Don't be obtuse. It's not plagiarism - since all these bots are made by the same people (Bristol Robotics Laboratory). I mean with plagiarism the pretending of novelty where it isn't. I'd expect a reference to at least one level of previous research in every article. It's like the crediting the sources of pictures - it enables to trace whole history of subject. It's pretty common to publish stuff which extends upon your previous work. (heck, I've seen a guy republish his work just because he added an email client to the gridcomputing software he developed...though that was somewhat frowned upon at the conference). It's NOT plagiarism if you cite the work you reference. And citing your own previous work is standard procedure (otherwise you'd have to explain everything from scratch every time). Remember that (e.g. for a PhD) you're working on one subject for multiple years. You're expected to publish on average two papers per year...which is about the time interval for substantive improvements. Unfortunately the article doesn't make it very clear how the new setup makes the bot better. Since it's part of FP7 the research is limited to 4 years anyhow. There are no more grants beyond that scope - so there's no reason to go fishing for any. But from what I get from their website there is a lot going on that isn't easily shown in a video, so it's unclear which stage of the project the shown robot represents. OK, so the usual question: Just HOW did the Shrew manage to survive before the evolution of the whiskers? Just HOW did the whiskers "evolve", given that all the required mechanisms need to be in place at once BEFORE it will work? Maybe it's time to reconsider your staunch adherence to the religion of evolution. Why do people insist that God and evolution are mutually exclusive? Because the same genealogy showing the earth to be only 6k years old is the same genealogy used to prove Jesus matched the prophesy. Admitting fault in the first case would be fatal to the second. You could try to explain how the shrew evolved whiskers (hint, when it started, it wasn't a shrew yet), but then they would just dodge and bring up something else you dont have the time to explain.